Tones from black to white are building blocks of photographic images. Photographic paper is coated with a thin emulsion of silver that is sensitive to light. If it is exposed to light and treated with developing solution, the paper will go solid black. 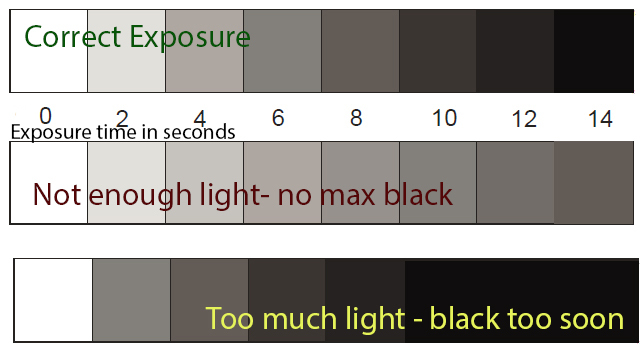 Changing the amount of light (exposure) by intensity or time can create in between shades of gray. This is the basis of photographic printing. Black, White and various shades of Gray. 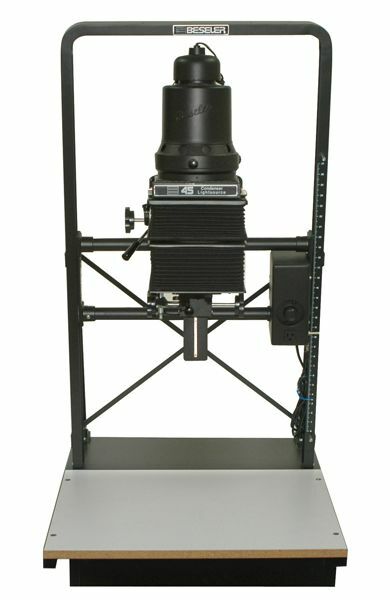 Using an enlarger as a light source to control light and time to create a grayscale. Put a strip of paper on the baseboard - emulsion side up. Expose for "One Hit" of 2 seconds. Move the cardboard tyo cover another 1/2"
Repeat so you have at least 6 hits and cover the whole strip. Develop the teststrip and evaluate. See where you have Maximum black. If you have at least 5 hits you can use this number to expose your photogram. Place paper on Baseboard - emulsion side up. Expose for the number of hits that reached maximum black. Move objects between hits to create gray areas, overlapping, illusion of motion.